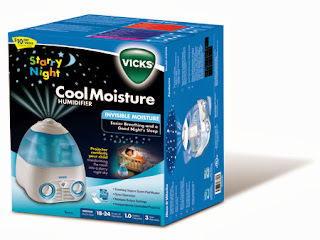 To help relieve cough and congestion, check out the Vicks Starry Night cool mist humidifier. Featuring a projector that comforts your child, it creates a calm night perfect for children of all ages. The Starry Night humidifier has two speed settings and offers quiet operation for comfort during the night. The best part is that the projector operates independently from the humidifier so you could use as a night light. It projects a sea of stars on the ceiling while changing colours. 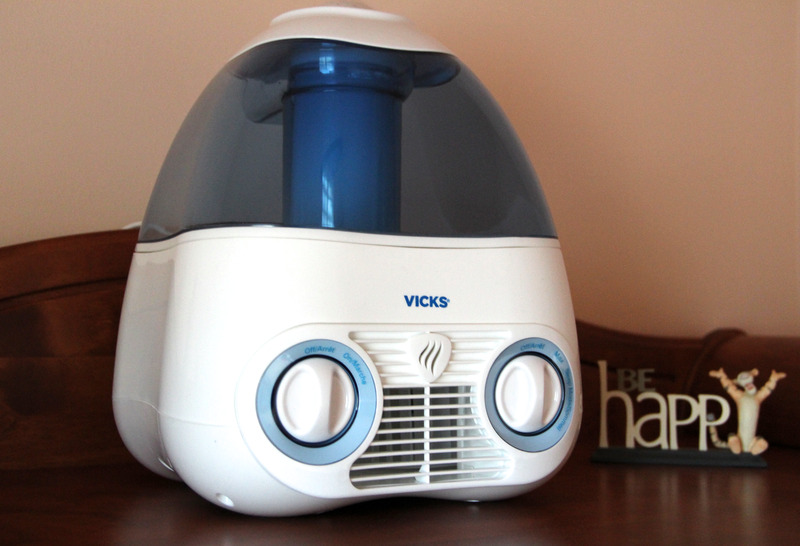 The humidifier comes with a scent pad which releases Vicks soothing vapours when heated. It has a run time of 12 to 24 hours and a one-gallon tank capacity, and is recommended for medium-sized rooms. You can purchase the Starry Night CoolMoisture Humidifier online at Amazon.ca as well as in-store at places such as Toys R Us, Walmart, PharmaPlus, and Loblaws. Prices range from $49.99 to $59.99. I am also giving away one here as well. To be eligible, you must be a resident of Canada and you must fill out the form below. Don't forget there is still time to enter to win a Honeywell AirGenius 5 Air Cleaner! This would be a great soothing way to treat a child with breathing problems. This would be great because our house is so dry we get bleeding nose's and had our hair cut at home and hair was sticking to things, yup real bad. I love using a humidifier for my daughter. It helps keep her well, and I think she likes the noise while sleeping. I like that the Vicks humidifier projects stars on the wall....very relaxing and comforting for little ones while they sleep. We had a vicks humidifier when I was a kid. They work so well. would love to win this for my niece to use for her kids. I would love to win this because it would be great to have a humidifier in the kids' room that has a night light too. I would love to win because my kids tend to get sick a lot this time of year, and my 5 year old is also VERY afraid of the dark, so this would help with two issues! Thanks for the chance. I would love to win this ,to help when my kids are sick. awesome I have never seen one like this. I think this would make kids feel a little better. My grand daughters could sure use something like this when they are sick. I need a cool moisture humidifier, the traditional steam one that we do have makes me nervous around the little one. I would love to win for my daughter & the rest of us when we get sick. I would like to win because my kids would love a humidifier that projects a sea of stars on the ceiling. This would be ideal for my little guy's room and he would love the stars. I would like tho win this as a gift for a friend. I would like to win this for my boys' room as our house is quite dry especially in winter. I would love to win this for when my grandsons sleep over. I would love this for my younger son. Right now we are sharing a humidifier between my two boys! It would be so much easier them having their own! I am expecting and this would be great for the nursery! I would love to win this because we have really dry air in our house, and our son has recently started getting nose bleeds due to the extreme dryness in his room. This would help out greatly! To replace our old one. Colds are common in my household, and this would be wonderful for those sicky days! This would be great for the winter months in our home, especially for my son's room. This would be great for the winter and a new baby! I'd love this for in the winter when our throats get so dry in our house. I love that it offers quiet operation, allowing children to sleep undisturbed! I would love to win this because I have trouble with the dry air at night and with an upcoming wedding on the horizon, my budget is very tight. It would be nice to get a good night's sleep! I would like to win this because I love that this Starry night Humidifier releases Vicks vapours to help with congestion and breathing when the kids are sick. This would be perfect for my toddler's room. I would love to win this for our newborn as it's dry in winter where we are! This would be very helpful for my daughter who regularly gets bloody noses. My daughter has asthma and in the winter she always ends up with a cough, this would be great for her to have in her room. I would love to win to keep my daughter's happy and healthy. This would be wonderful to use when my kids get sick. Would love to get this for my boy's room. He gets nose bleeds when the air is too dry, especially in the winter so this would be perfect for his lil room. It sounds perfect for this winter's dry air. Oh this is so cute and would help with our super dry house that blows warm air from the heaters! We're always sick in the house, this would be good for the kids. i would love to win this because the air gets really dry where i live! this would be great! I would love to win this for my son. His room is always dry during the colder months and he uses a night light. What a better combination then a humidifer and a light :) Would love to win. It would made the air in the house much better as it's too dry! It's cute for the kids room and would help with the air. My children get sick and this would look groovy to them when they are sick. A soothing cough remedy. I'd love one because it looks like a cool way to enjoy the effects of the cold medicine :p LOL.... but srsly- my kids would love the lights while I enjoy the humidity! I'd love to win because cold season is almost here and we don't have a humidifier! My cousin just had a baby. And this would be the perfect gift. Love the scent pads! I would love to win the cool mist humidifier for my baby as recommended by his doctor because he's gotten sick during the cold weather. Love this, but filters are expensive, love the filterless one now. This would be great for my sons room. I like that it doesn't use steam! 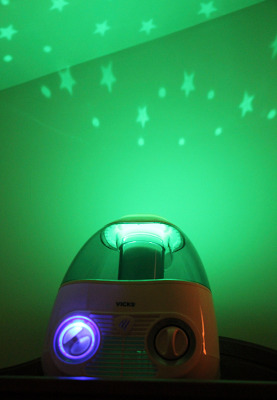 I would love to have a Starry Night humidifier because my children sleep so much better during the winter months, (when the air in the house is so dry) with a humidifier in their room. The colours and starts make such a comforting environment! I'd like to win this for my niece for when she's sick. Due to the air quality, I am starting to get real congested and bloody noses in the morning. Your humidifier would help at lot. I'd like to win the Starry Night humidifier because my son says his nose is dry when he wakes up in the morning. It would be nice to add some moisture to the air in his room. Would love to win this great prize. I am so tired of waking up with a dry mouth. This sounds like it would solve my problem. I love the starry night lights and a humidifer is definitely needed this winter, as I am really noticing the dry air. We have one in one DD's room and need one for the other! It really does make a difference in the winter! I'd love to win it for my grand-daughter. It's very dry in my daughter's home. Well it gets very dry in the house in winter, so this would help out. Looks interesting. I'd love to win for my nephews! I think this would be soothing for them when they're not feeling well! I'd love to win it for a baby on the way shortly! With winter, it's dryer in our home. This humidifier would be the perfect addition to make our home a better place to live in. My son's room is SO dry!